(Bloomberg) -- Venezuelans poured into the streets Saturday, demonstrating against a near-total breakdown in public services and rallying behind National Assembly leader Juan Guaido, who is leading a drive to end two decades of socialist rule. The protests come after a month of rolling blackouts that have paralyzed daily life and dried the water taps in huge swaths of this oil-rich nation. Guaido, who is recognized by the U.S. and some 50 other nations as the interim president, called for demonstrations in major Venezuelan cities against the latest miseries suffered under the six-year rule of President Nicolas Maduro. Guaido said that two opposition lawmakers, Nora Bracho and Renzo Prieto, were detained during demonstrations Saturday in the northwestern city of Maracaibo. He said later in his speech that they had been released. El Nacional also reported the legislators’ detention and later release. Venezuela has been reeling from hyperinflation, hunger and months of political unrest. Power cuts and water shortages over the past week have driven thousands of thirsty residents nationwide to take to the streets to demand services be restored. The 35-year-old Guaido, who invoked a constitutional provision to launch an interim government in January, is now trying to meld the popular outcry with his protest movement in a renewed push to oust Maduro. Still, Maduro continues to control the crucial security and military apparatus and receives support from Russia and China. His regime has cracked down on dissent and earlier this week stripped Guaido of immunity from prosecution, opening the door to his arrest. 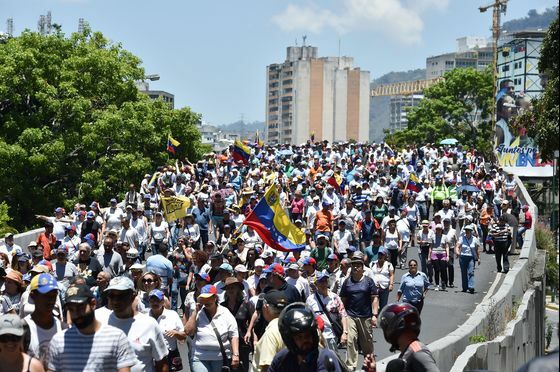 On Saturday, the government called on followers to march across central Caracas to the Miraflores Presidential Palace. The rally drew crowds of red-clad supporters.